This CD was released on May 19, 2014. It includes my favorite Classical piano pieces along with my own compositions. It is available for sale at CDbaby and ITunes. I am a classical pianist who loves to just sit down and doodle at the piano. This CD, A Spark of Inspiration, is a culmination of my college years. It includes the best from the classical pieces I have studied as well as my own compositions. Each one started with a small spark, which took perseverance, creativity, and even struggle to catch fire and turn into a flame big enough to spread light. 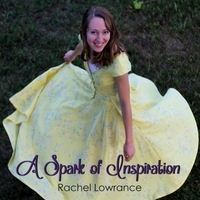 The pieces I composed each had their own story – some igniting in a quick flash, some surviving for many years as smoldering embers until a new, fresh spark of inspiration kindled them into full light. The Classical compositions also contained sparks that only awoke when I poured my heart and soul into them. I wrote this piano piece over the course of this summer - a very beautiful time in my life. It starts out like a quiet sunrise, which quickly progresses into a simple re-occuring melody. Like a journey, this melody flows through highs and lows, always overflowing with an undercurrent of joy.